Sure, luscious high-dynamic-range visuals look impressive during demos, but does HDR really matter when you’re gaming? That was the primary question I wanted to answer when AMD sent me the Samsung CHG70. It’s one of the first gaming-centric monitors to carry VESA’s DisplayHDR 600 certification and AMD’s bleeding-edge FreeSync 2 technology. It’s also one of the best PC displays I’ve ever used. Seven monitors currently crowd my office, offering various features and tech specs. None feels half as immersive as the Samsung CHG70 ($700 on Newegg and Samsung.com). This elegant monitor offers vivid, accurate colors at a sharp 2560x1440p resolution, augmented by FreeSync 2 technology that eliminates tearing and stuttering while simultaneously optimizing the video output while handling HDR content. Gaming on it feels like bliss. The bevy of features on offer combined with the CHG70’s massive, curved 32-inch panel makes other displays start to feel, well, a bit flat. It impresses even after migrating from a 4K G-Sync setup, though a few niggling flaws keep it from perfection. The state of HDR content on PCs isn’t quite as grand. Let’s dig into the Samsung CHG70, FreeSync 2, and HDR video and games on the PC. 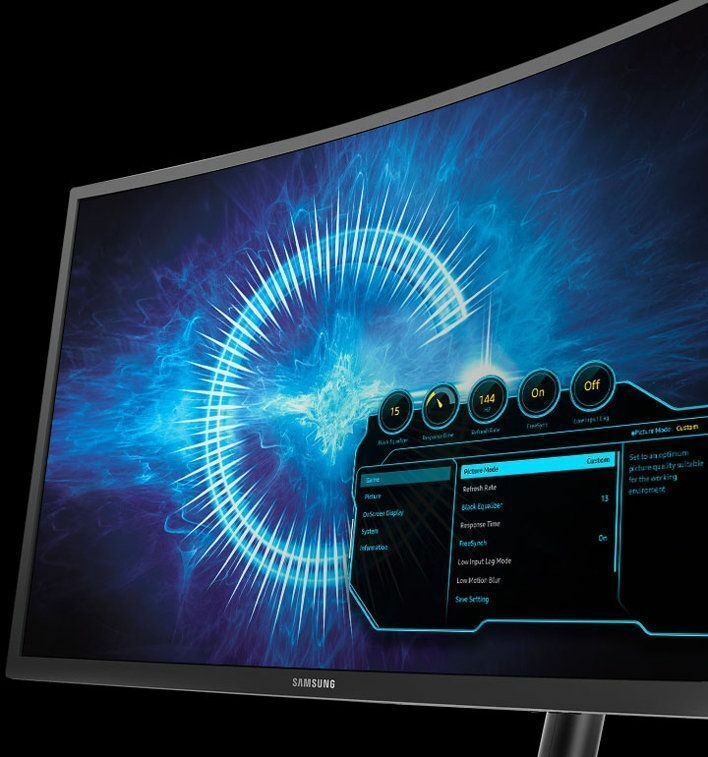 The Samsung CHG70 gets all up in your face, to the point of having a learning curve. Stick with it. That stand is even deeper and wider than it looks. When I say it gets in your face, I mean that literally. 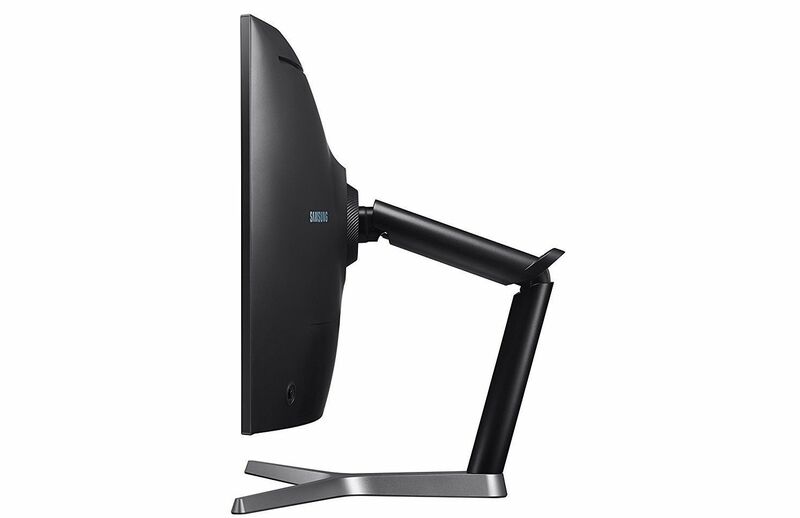 The CHG70’s stand juts out rather than using a simple vertical orientation, and as a result, the screen sits a full three to four inches closer to a user’s face than other monitors. When first confronted with the display’s massive 32-inch span and aggressive 1800R curvature, I didn’t just feel immersed, I felt engulfed—like a person sitting in the front row of an IMAX theater. For the first day or two, I found myself reflexively leaning back in my chair to escape the gigantic display’s envelopment, especially when editing documents and spreadsheets. It was so searingly white and everywhere. But the mildly uncomfortable feeling went away after a day or two. Gaming helped attune me to the CHG70’s unique properties—being engulfed in the worlds of Far Cry 5 and Destiny 2 proved wonderfully compelling, and conditioned me to lean into the screen rather than shy away. After that, using the display during everyday tasks seemed less daunting, and I came to appreciate just how superb a monitor this is. VA panels have better contrast ratios, color accuracy, viewing, and brightness compared to standard TN displays, but often suffer from motion blurring due to poor response times. The CHG70 includes technology to reduce motion blur and it works like a champ. Games felt crisp and never exhibited ghosting or corona effects, though MLG CS:GO pros might want to stick to 240Hz TN displays for peak responsiveness. The Samsung CHG70’s on-screen display for adjusting settings. Images look stunning on the CHG70, too, even if they aren’t in HDR. Samsung calibrates the monitor for accuracy at the factory, shipping it with a color calibration report in the box. The LED screen is augmented by Quantum Dot technology that allows it to produce more shades of color, and the CHG70 hits 125 percent of the sRGB spectrum. Colors burst from the screen and dark scenes deliver inky, deep blacks. A small joystick on the rear of the screen lets you tweak the monitor’s settings as you see fit. The 4K IPS display I’m using as my second monitor delivers bright, clean images but it feels lackluster after staring at the CHG70 all day. The higher resolution still holds some advantages though. Compared to the 4K G-Sync display I’d previously used as a daily driver, text on the Samsung CHG70 can look slightly pixelated and “jaggy” on some characters with long, undisturbed straight edges or curves. It’s most pronounced on larger text, though, and doesn’t detract from the overall experience—especially while gaming. Take note if text accuracy is paramount to your job, though. 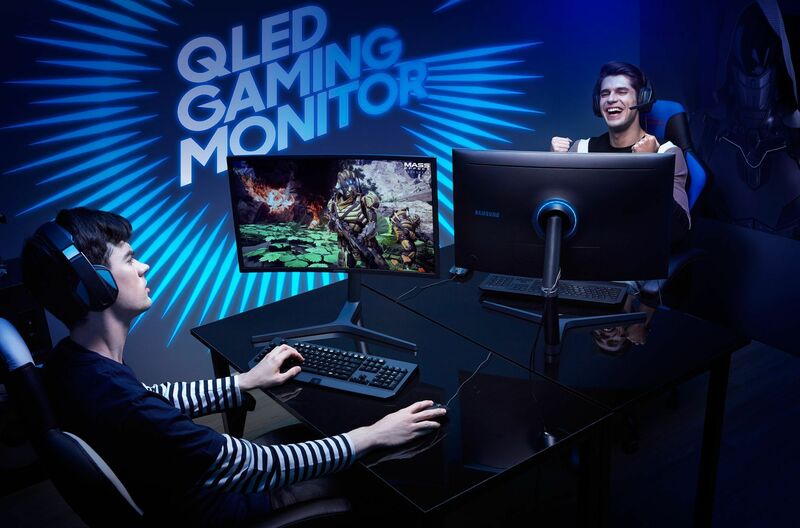 The Samsung CHG70 was one of the first monitors with support for AMD’s FreeSync 2 technology, so this already great monitor can be pushed even further if you have a compatible Radeon graphics card. FreeSync 2 builds upon the foundations FreeSync laid. Standard FreeSync synchronizes the refresh rate of your graphics card with your monitor. Doing so eliminates the nasty screen tearing and stuttering effects that can pop up in games. FreeSync doesn’t require the addition of extra hardware in the monitor, unlike Nvidia’s rival G-Sync, so FreeSync tech can be found in a wider range of displays, and often for cheaper. But in reality, FreeSync quality isn’t universal like it is on G-Sync displays; FreeSync displays only support tear-free gaming in certain refresh ranges that differ from product to product, and many monitors lose FreeSync support underneath that threshold. Those disadvantages disappear with FreeSync 2.